Roussillon, a very colorful town! Roussillon is north of our home base of Saint-Remy-de-Provence in the Luberon region of Provence. It’s another small town, but it has a unique and colorful history. For many year’s, this was one of the main sources of “ocre,” the red or yellow pigments made from the clay deposits of the area’s mountains. 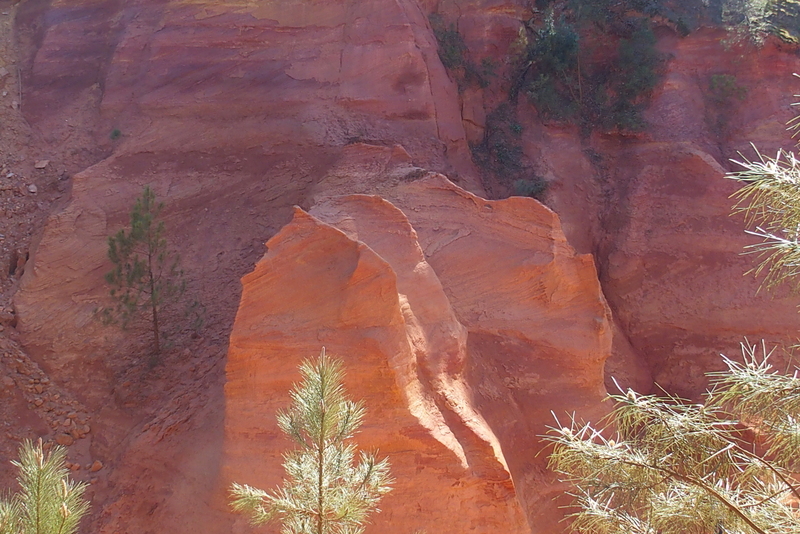 Seen from the main street of Roussillon, the ocher hillside. These ocher deposits were formed when the area was under the sea. Iron makes the soil look red, just like the iron rust gives the Golden Gate Bridge its distinctive red color. 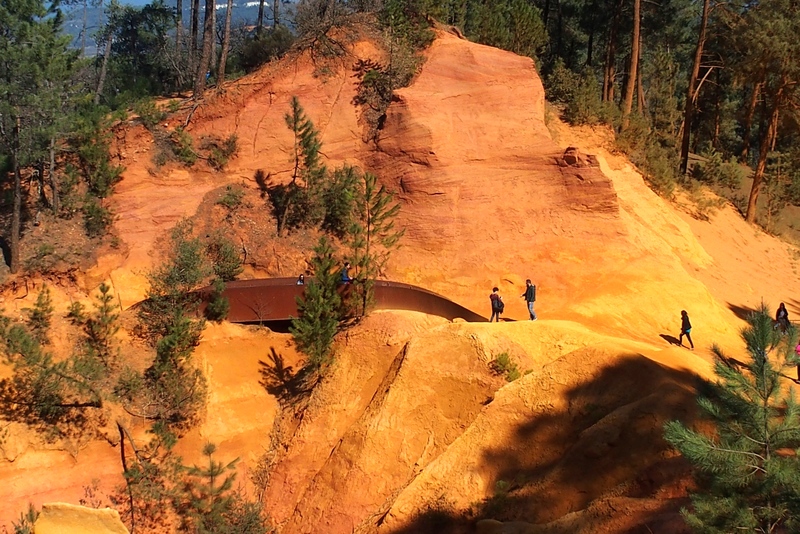 The rusted bridge is a good match for the iron-rich soil of Roussillon. In the late 1700s, Jean-Étienne Astier, a Frenchman from Roussillon, developed a process to extract, concentrate, and dry the pigment from the clay soil to make materials that could be used effectively for artists’ paints. Many gallons of pigment were probably made from the clay from this site. 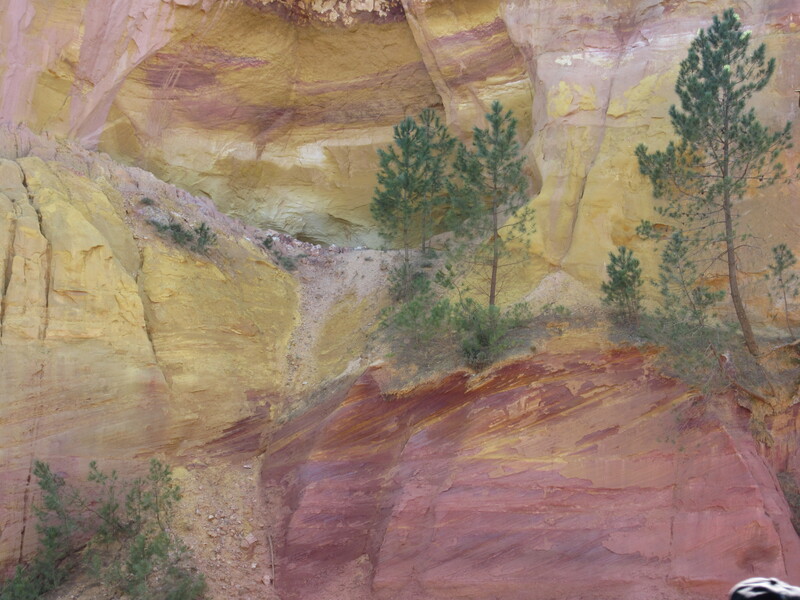 With the natural red and yellow coloration, the hillside takes on the appearance of an Impressionist painting. With the advent of capabilities to create synthetic ochers, Roussillon’s original eight ocher “mines” have been shut down. Now the town’s main industry is tourism for all those interested in seeing the beautiful colorations. A scenic walk allows kids (and adults!) to climb the red walls and play in the sands. At the end of the day the kids depart with red pants. Going home from a day in Roussillon’s colored sands. 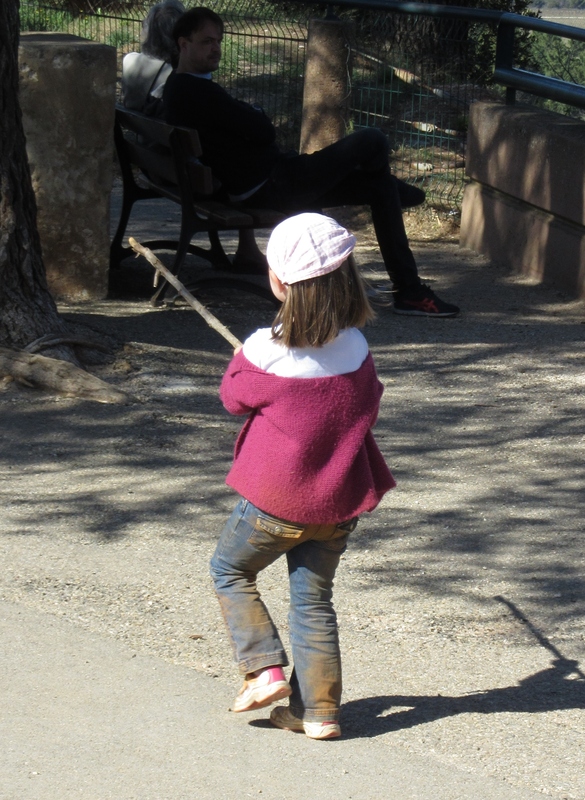 This is 2015, but the red cliffs have had the same appeal for kids for hundreds of years. Small samples of ocher paints. 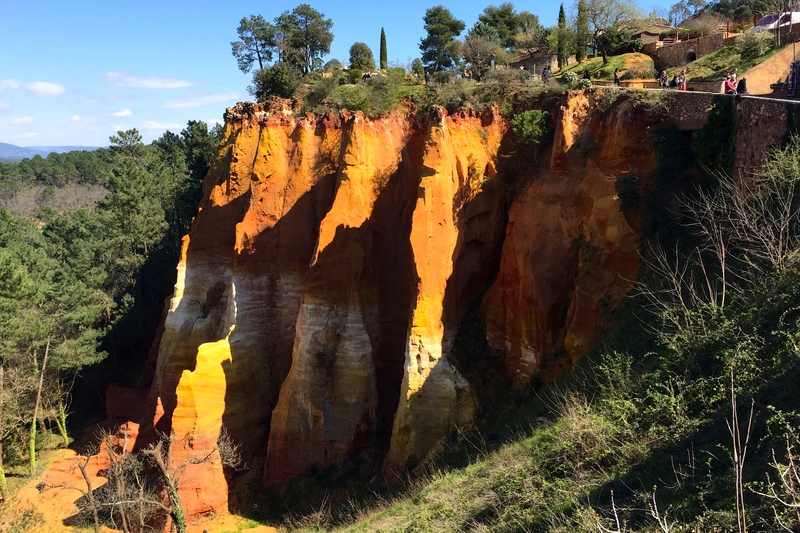 What else is there to see in Roussillon? 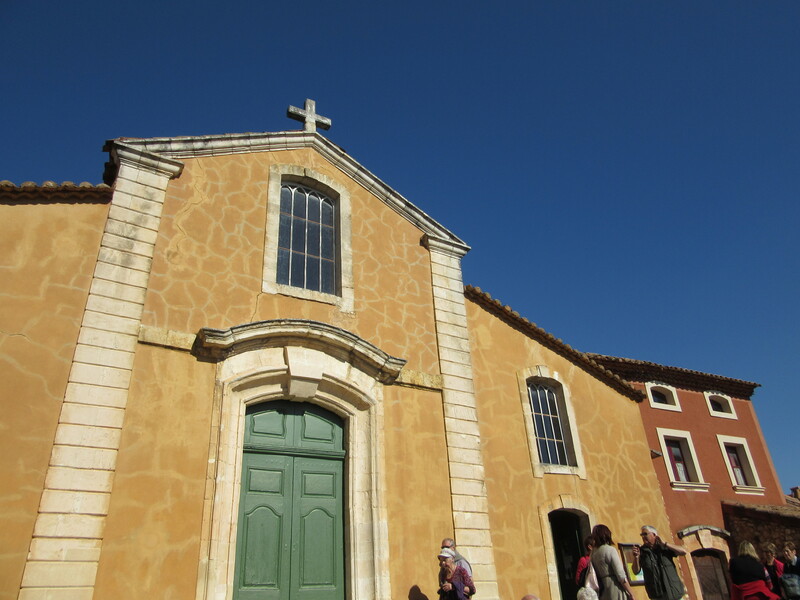 A climb up the narrow streets leads to Roussillon’s St. Michael’s Church. Interestingly the church has both yellow and red ocher tints on the outside. On the inside, some of the religious artwork uses ocher coloration. 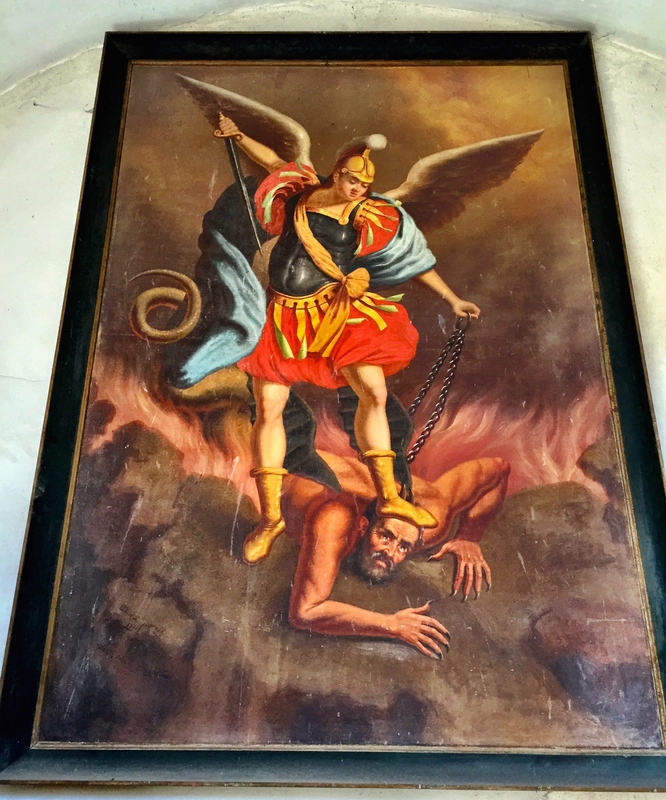 The Archangel Michael slays Lucifer. 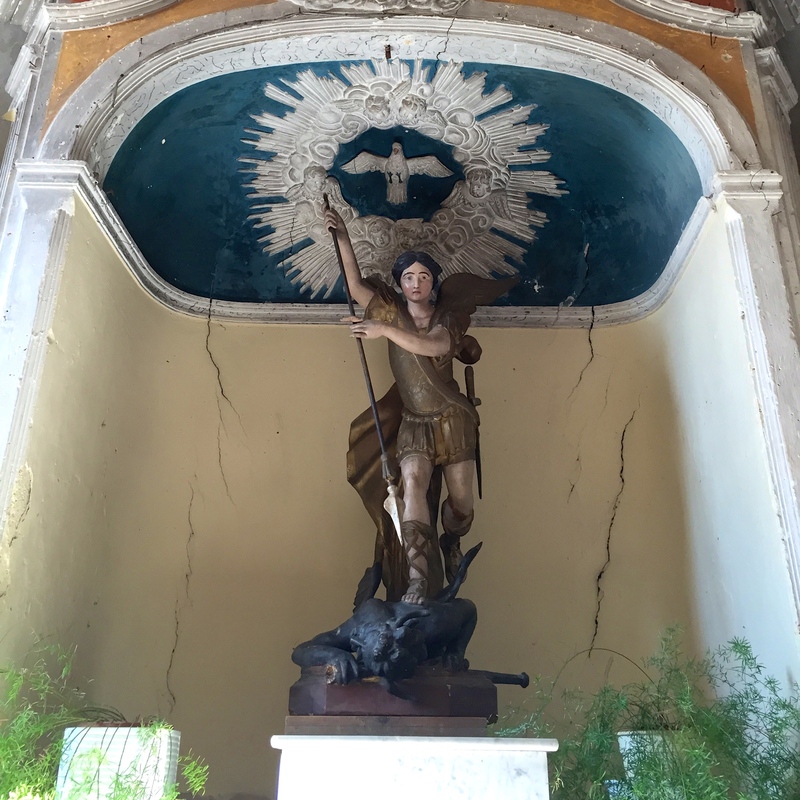 Another version of Saint Michael slaying Lucifer, this one an almost life-size sculpture. Back outside are colorful flowers. 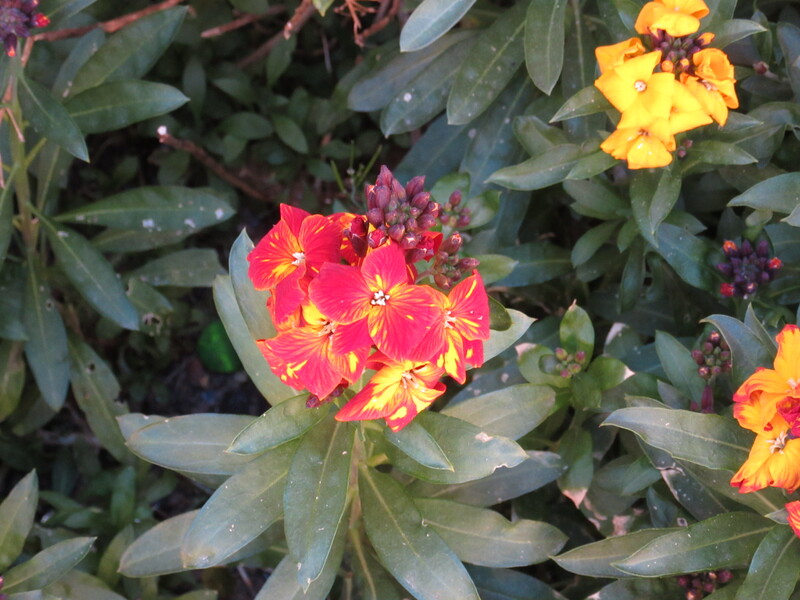 Flowers outside the church repeat the red and yellow theme. 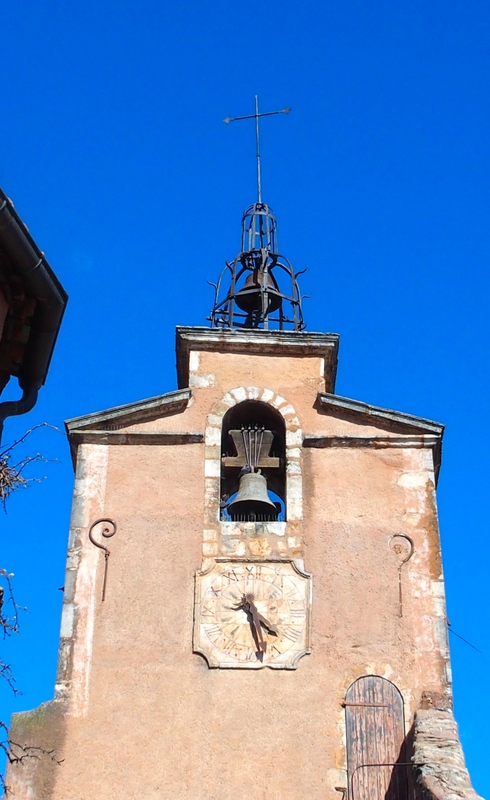 Down the street is Roussillon’s bell tower, with open ironwork to let the mistral winds blow through. One of many mistral bell towers we’re seeing in Provence. We ended the day enjoying a beer in the square and looking up at other ocher-painted buildings. This window has been photographed many times! This entry was posted in Travel Journal and tagged church, France, Luberon, mistral bell, ocher, Provence, Roussillon. Bookmark the permalink. 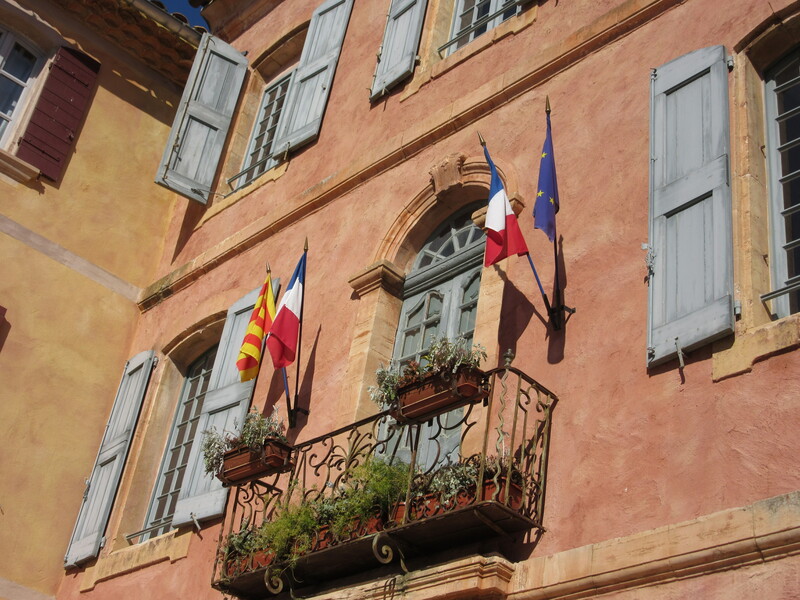 1 Response to Roussillon, a very colorful town! Great job on this Nance. I’m happy to live vicariously through your log. See you soon.